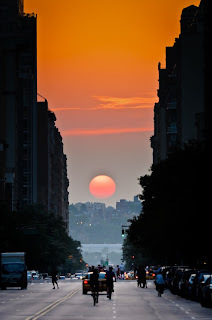 On the Way to ONEderland: Manhattanhenge! Every summer on certain dates the sun lines up perfectly with some of the city's biggest, widest boulevards as it sets over the Hudson River. It makes for same darned purty evenings. This is not my picture, to be fair, but I would have snapped one if I could have gotten my hands free. I was biking home in all this glory last night. I'm trying to get off my derriere and get moving more, and so far so good with the bike. It's such a joy to be on it again, and pushing myself to regain some fitness. I really huff and puff a lot, but I think I can feel my strength returning with every ride I take. I am also trying to lay off the wine, which is not easy for me because a friend of mine recently returned from Spain with a truly delicious bottle of Rioja that he gave me...one taste, and I was hooked. Naturally, I tracked down a wine store in Manhattan that carries it and have been indulging all too frequently. Must battle down the wine demons! Sweet pic! Glad you are getting out there and cycling! Hi Ish! So glad you are back out and about!!! And whoever took that photo....it's GORGEOUS! Have a great rest of your weekend.